The movie poster for Ask the Dust. 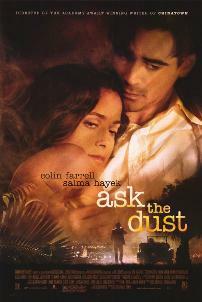 Ask the Dust is a 2006 American-German film based on the book Ask the Dust by John Fante. The film was written and directed by Robert Towne and remains, as of 2015[update], his last feature film. Tom Cruise (with Paula Wagner and Cruise/Wagner Productions) served as one of the film's producers. The film was released on a limited basis on March 17, 2006, and was entered into the 28th Moscow International Film Festival. It was filmed almost entirely in South Africa with the use of stages to portray Los Angeles. The story is set during the Great Depression, specifically around the time of the 1933 Long Beach earthquake. Camilla (Salma Hayek) is a fiery, beautiful Mexican café waitress who aspires one day to be above her current standing in society, to make something of herself, to give her and her future children a place and chance in the world. Arturo (Colin Farrell) is a struggling writer who comes to Los Angeles's Bunker Hill area to start his writing career. Though he falls in love with Camilla, he does not marry her. Later, Camilla is infected by tuberculosis and leaves Arturo without informing him. When Arturo finds her, she is about to die and he promises to marry her, but Camilla dies and Arturo writes a novel dedicated to Camilla. Arturo writes a dedication in one of his books to her and throws it into the sand. Part of the film was shot at Pinelands High School (Cape Town, South Africa), on fields modified to simulate a Los Angeles scenery. The rights to the novel once belonged to Mel Brooks, though he let them lapse. Towne met Fante in the 1970s. This meeting led to his interest in the project. Despite finishing the script in the early 1990s, he couldn't find financial backing from a studio. During this time, Farrell's role was originally set to be played by Johnny Depp but he dropped out. Later Val Kilmer accepted the role and also dropped out. Another delay was Hayek initially rejecting the role to avoid being typecast as a Mexican immigrant. She accepted the role eight years later. The film received negative to mixed reviews from critics. The review aggregator Rotten Tomatoes reported that 35% of critics gave the film positive reviews, based on 104 reviews. Metacritic reported the film had an average score of 58 out of 100, based on 33 reviews. ^ "Ask the Dust Movie Reviews, Pictures - Rotten Tomatoes". Rotten Tomatoes. Archived from the original on 29 March 2008. Retrieved 2008-03-29. ^ "Ask the Dust (2006): Reviews". Metacritic. Archived from the original on 20 April 2008. Retrieved 2008-03-29. This page was last edited on 7 March 2019, at 03:17 (UTC).